Flanked by Israeli and Palestinian negotiators, Secretary of State John Kerry said Tuesday that the United States will play the role of facilitator in final status talks between the parties that he hopes will lead to an agreement in nine months. 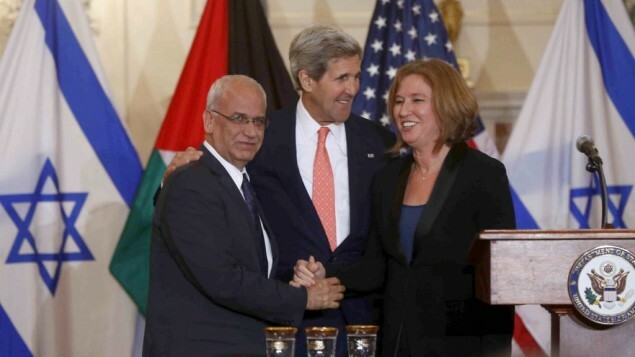 “The parties agreed here today that all of the final status issues, all of the core issues, and all other issues, are all on the table for negotiation,” Kerry told journalists at a press appearance with Israel’s Justice Minister Tzipi Livni and Palestinian chief negotiator Saab Erekat at the State Department Tuesday. Describing the atmosphere in two days of talks as “constructive, positive,” Kerry said the parties had agreed to “remain engaged in sustained, continuous and substantive meetings” on the core issues over the next nine months, beginning with a meeting in two weeks in either Israel or the West Bank. The United States will play the role of facilitator in the process, Kerry said. State Department officials said newly appointed U.S. peace envoy Martin Indyk will be spending much time on the ground in the region, going back and forth. Kerry spoke after President Obama met briefly with the two teams Tuesday morning. The White House stressed its support for Kerry’s effort, after some reports suggested the president was keeping the peace effort, seen as a long shot, at arms-length. Kerry meantime heaped praise on Israeli Prime Minister Benjamin Netanyahu and Palestinian Authority President Mahmoud Abbas for giving another go to the peace process after a series of failed efforts over the past two decades. Israeli-Palestinian peace talks will resume in Washington Monday after a three year hiatus, the State Department announced. Secretary of State John Kerry will host Israeli and Palestinian negotiators at an Iftar dinner Monday night following informal talks this afternoon at the State Department. Talks are scheduled to continue on Tuesday. At 11am, Kerry is expected to announce that he has appointed former Clinton Israel envoy and Near East diplomat Martin Indyk as his lead negotiator, as Al-Monitor first reported was under consideration. The Israelis will be represented in the talks this week by Justice Minister Tzipi Livni and Yitzhak Molcho, and the Palestinians by Chief Negotiator Saeb Erekat and Mohammad Shtayyeh, the State Department said in a statement. On Sunday, Israeli Prime Minister Benjamin Netanyahu announced that Israel would release 103 Palestinian prisoners over the duration of talks, which will last a minimum of nine months, he said. His cabinet voted in favor of the prisoner release, as well as to put any prospective peace agreement reached with the Palestinians to a referendum.